I can’t believe I didn’t think to write about this life event until now. I was reminded by a discussion on the Aircraft Owners and Pilots Association (AOPA) LinkedIn group asking for folks to submit aviation photos. 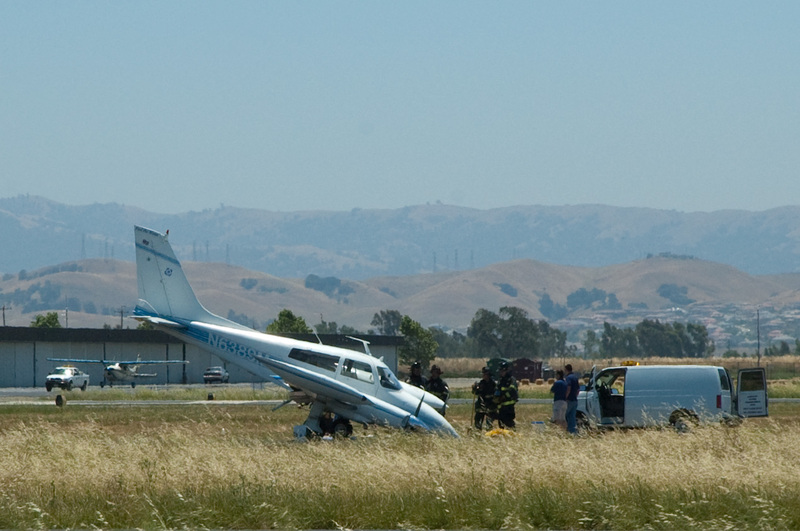 As I was looking through my “Flying” photos I remembered the shots I took at Livermore Municipal Airport (KVLK) on the beautifully clear day I was suppose to go on my very first solo. I made it all the way to getting ready to take off when I was instructed to return to the parking area as I wouldn’t be taking off anytime soon. Okay, before you think it was because I was a total noob and did something wrong, it wasn’t. Unfortunately, it was because they were shutting down the airport while waiting for a plane that was in distress to make an emergency landing. Here’s how the events unfolded. I had just returned to the airplane parking area from a flight with my CFA (Certified Flight Instructor) when he turned to me and said, “Well, the wind is a little stronger than I would have liked but I think you are ready to head out for your first solo.” Wow, this is it. He wants to see if, without him in the plane slapping my hand or asking me what I’m doing, or should be doing, I can pilot the craft and bring the flight school’s plane back intact. Okay, he’s experienced. If he thinks I’m ready then I think I’m ready. So, my instructor hopped out and I asked the ground controller for clearance to taxi. Guess what? He told me to head to the runway. I must say that I was disappointed, and though not a good situation at all, at least I didn’t screw up. Also, I had brought my camera in anticipation that I would solo that day and wanted to get a picture. So, I taxied back to the parking area and grabbed my camera from my truck as well as my scanner so that I could monitor the radio play between pilot and tower. The conversation was pretty sparse and consisted of such things as stating he had two souls on board and would like to declare an emergency. There is a fire department located on the airport grounds, a short distance from where I was. They were on the ready. 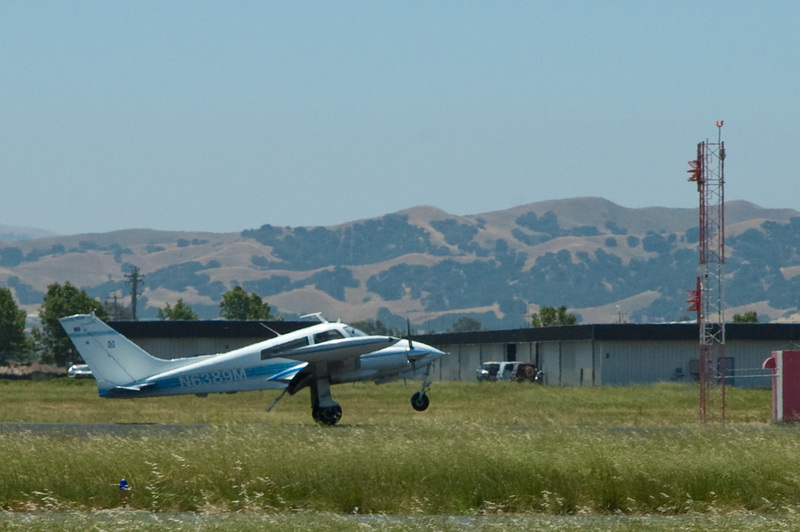 It wasn’t too much longer before the plane was turning base to final on a very nice approach to 25R, the widest and longest runway at the Livermore general aviation airport. I snapped away as the pilot expertly guided his craft over the end of the runway and then leveled out, settling down on his main gear while maintaining an attitude that kept his plane’s nose slightly up. As he slowly lost speed the nose settled down onto the nose gear and continued to the pavement as the gear collapsed up toward the fuselage. I was amazed at the great job this pilot did at smoothly flying down the runway and setting down his plane so soft and straight. When the nose reached the asphalt the sound of grinding metal shot across the field as the plane continued sliding along the runway. Not too much further and the plane came to rest with the tail pitched quite high. Quite quickly the door opened and the two occupants exited the plane. About the same time the fire truck rolled up along with some other airport vehicles. Several individuals lingered about the plane, probably taking in the site just as I and my instructor were from my vantage point. Wow, what a great ending to what could have been a terrifically bad situation. Definitely calm and experienced piloting skills were present in the left seat that day. Though the occupants of the plane were quite fortunate, I later found out that the plane wasn’t so fortunate as it had encounter prop strikes on both, just recently rebuilt, engines. As a student pilot, ready to solo for the first time, watching this really left me quite humbled and impressed at the skill of the pilot in charge of that plane. Did it put me off flying at all? Definitely not! In fact, the very next day, June 11, 2006, I was back at the airport and headed off on my own. I completed my first solo flight consisting of three take-off and landings and about .4 hours of flight time. It’s always good when the number of take-off’s match the number of landings. Better yet, if you are able to finish your flight and fill out your log book that’s a good day flying. The culmination of my solo was the traditional cutting off of the back of my shirt. Such a proud moment. If anyone is looking for someone to keep them company flying out of Livermore let me know by leaving a comment. Unfortunately, time and money have required me to adjust my life such that I have not flown since August 2008, when I flew my Uncle, some cousins and their children on a few sightseeing trips around the East Bay. Arghhhh! I need to go get my biennial done so I can get current again and go get my $100 hamburgers.